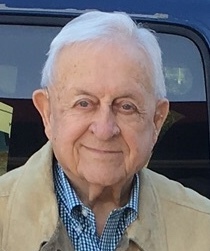 William Marvin Robbins of Birmingham, Alabama passed away peacefully on January 20, 2019 after several weeks of experiencing the end stages of congestive heart failure. Mr. Robbins was born to William Hardy and Ruby Lee Robbins on May 16, 1928 in Opp, Alabama. He was the oldest of five children. In the fall of 1945 Mr. Robbins met the love of his life, Mary Helen Johnson, and they married in March 1946. They were happily married for 71 years. Earlier in life Mr. Robbins enjoyed playing high school basketball, and played Triple-A baseball. He was an accomplished golfer who enjoyed competing in many tournaments. Mr. Robbins was a 32nd degree Mason in Prattville Lodge No. 89 and also a Shriner at Birmingham’s Zamora Temple. For over 45 years he was a member of Mountain Brook Baptist Church. He served as a Sunday school teacher, committee member, deacon, and later received the honor of becoming a Life Deacon. Mr. Robbins especially enjoyed helping on Wednesday night church services where he collected money for the dinners served before Bible studies. He adored seeing the young children come through his line and giving them a high five. Mr. Robbins began his career as a meat market manager for the A&P grocery store chain. Thirteen years later he joined Liberty National Life Insurance Co. Within two years he was promoted to sales manager. He went on to become district manager, and his district led the company for three consecutive years. In 1972, Mr. Robbins was named Agency Vice-President for the company. After his retirement from Liberty National, Mr. Robbins opened his own insurance and real estate agency, and later completed his career as a residential real estate appraiser. He “finally” retired at age 85. He is predeceased by his wife, Mary Helen Johnson Robbins; and survived by his daughter, Rhonda Robbins Galyean and her husband, Daniel Reece Galyean, Sr. of Rogersville, Alabama; his son, Anthony Marvin Robbins of Birmingham, Alabama; three grandsons, Matthew H. Reeves and his wife, Danielle of Stafford, Virginia; William Anthony Robbins and his wife, Olivia Grugan of Huntingdon, Pennsylvania; and Mark Andrew Robbins of Birmingham, Alabama. He is also survived by one sister, Mary Ruth Ironnecklace of Pensacola, Florida. He has five great grandchildren, three nieces, and five nephews. The family wishes to express sincere gratitude and love to the staff and caregivers of Brookdale Senior Living in Homewood, Alabama who served Mr. Robbins with great love, care, and concern. A memorial service for Mr. Robbins will be held on Friday, January 25, at Mountain Brook Baptist Church on Montevallo Road in Birmingham at 11:00 a.m. Visitation will be after the service. In lieu of flowers, the family has requested donations be made to the American Heart Association or to St. Jude’s Cancer Hospital for Children.